书籍简介: Playing with numbers--that's what this book from Murphy (The Best Vacation Ever, 1997, etc.) is all about. Part of the MathStart series, this entry introduces the art of estimation. Two boys are engaged in the project, one estimating, the other counting. 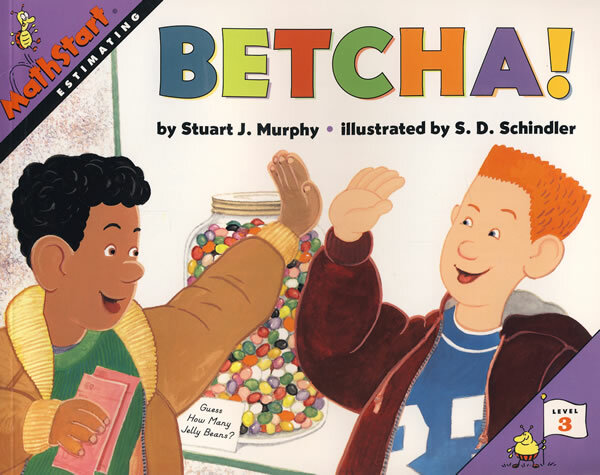 Their ultimate goal is to try to figure out how many jelly beans are in a big glass jar and win tickets to a sporting event, but the storyline bows deeply to the emphasis on estimation as a process. As the boys head downtown to the toy store and the jelly beans, they estimate the number of people on the bus, the numbers of cars in a traffic jam, the total prices of goods in a window, all the while demonstrating both rounding off and how to count a small number and apply that to the great, uncounted whole through the use of multiplication, fractions, and simple geometry. Murphy's success is in beveling the sharp, unforgiving reputation of math and in showing how numbers can be toyed with. Readers may come away with the sense that they are not slaves to numbers--it's the other way around. (further reading) (Picture book. 6-9) -- Copyright ©1997, Kirkus Associates, LP. All rights reserved. --This text refers to an out of print or unavailable edition of this title.